This time of year is stressful for every parent. Where do you get school supplies at a reasonable price? Do you bring the kids with you or leave them with a sitter? How do you juggle several supply lists? And don’t forget about their school lunches! Most parents dread this yearly extravaganza because of the overpriced items, long checkout lines and multiple trips to the store. We’ve compiled some tips and tricks to make every parent’s back to school experience smoother, cheaper and even a little fun. Reduce the amount of waste you create over the school year by investing in a reusable lunchbox (if you haven’t already), and send your kids’ lunches in reusable food containers. Not only is it better for the environment to pack and bring a reusable lunch box and container, it can become a healthier alternative and less wasteful than school provided lunches. Check out these creative ways to pack your kids lunch– ones that they’ll actually want to eat! sandwiches and snacks to eliminate those pesky single-use plastic bags that end up in the landfill! Heads up, they’re not just for kids! We are all guilty of having that embarrassing “junk drawer” in our home, but this little drawer could become a junk-haven for our back-to-schoolers. How many of us have actually used 24 pens/pencils in an entire school year? Make this a fun game and have the kids rummage through the junk drawer for all the pens and pencils they can find. There should be plenty for the start of the school year! The glue sticks, erasers, rulers, flash cards, crayons/markers and scissors may be waiting for rediscovery also! Reduce your paper waste by reusing last year’s notebooks or using the back side of already used paper. A fun activity could be cutting up used paper for flash cards or scrap paper. If you must buy more paper for supplies, consider purchasing post-consumer recycling paper such as this notebook paper made from 70% post-consumer materials. 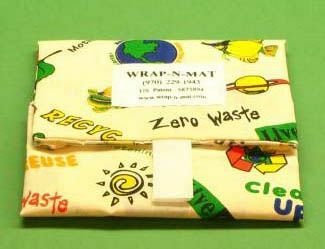 Why is it important to purchase post-consumer recycled products? This practice eliminates the use of extracting finite materials, prevents items from ending up in the landfill and helps to lower our carbon footprint. Learn more about how to close the recycling loop here. Don’t have any materials at home but you’re ready to jump right in? Bring your notebooks, folders and binders to Upcycle Treasure Box in South County for inventive ways of decorating for back to school! They have hundreds of different materials to choose from, so let your creative juices flow! Do you have materials that you no longer use? Upcycle Treasure Box also takes donations! Visit their website to learn more. We know that the back to school stresses can leave you dreaming of another summer vacation, but we’re here to help with any recycling and upcycling questions to make your experience a little more enjoyable! If you find that you must venture out to purchase new school supplies, please consider purchasing eco-friendly products that are made from recycled content. Not sure where to start your search for a green back-to-school year? Don’t worry, we’ve created a short list for you! And remember, being Earth friendly goes beyond your school supplies; be conscious about purchasing new clothing and shoes also! For the 2018-2019 Back to School Supply List, click here for all Saint Louis City Public Schools.